June was such a whirlwind and now it’s nearly the Fourth of July! It always seems to sneak up so fast and I’m never quite ready for it. 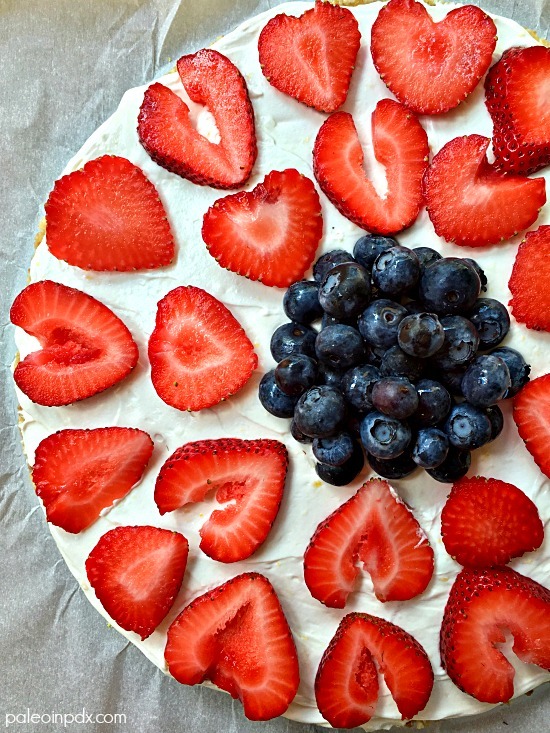 But, what better way to celebrate than with this beautiful, healthy, and patriotic fruit pizza? It’s incredibly easy to make and requires no baking or stovetop prep whatsoever. During the heat of summer, this is especially appealing, right? You do need to allow at least 24 hours for the coconut cream to chill before making the topping though, so be sure to plan ahead in that regard. Have fun with the fruit decoration and use whatever varieties you like. This time of year, I definitely recommend berries though since it’s their primetime, but obviously, there are many possibilities. I adore berry season and it’s the time of year that I eat the most fruit for that reason! Please know that if you use fruits prone to browning – like bananas or apples – you may want to soak them in a little fresh lemon juice before placing on top of the coconut cream. Also, catch me making this recipe on KATU Afternoon Live this Friday, June 29 between 3-4pm PST! Watch the replay of my segment HERE. Cheers and enjoy! Happy Fourth of July too! *Note: you can also use canned full-fat coconut milk if you can’t find coconut cream. Chill a 13.5 oz can of coconut milk in fridge for at least 24 hours. Then, scoop the cream part only from the can and follow the directions as listed. Blend all the crust ingredients in a food processor until sticky and crumbly. Line a 9-inch springform pan with parchment paper and press crust firmly into the bottom, in an even layer. You can also use a 9-inch pie plate with or without parchment as an alternative. Place in fridge to set while making the lemon coconut cream layer. In a medium mixing bowl, beat the coconut cream with a hand mixer a couple minutes or until whipped and fluffy. Then, add the vanilla, lemon juice, lemon zest, and raw honey or maple syrup, if using. Beat again to incorporate, scraping down the sides of the bowl with a spatula, as needed. Remove crust from refrigerator and take off the ring part of the springform pan. Spread coconut cream over the crust in an even layer (note: I covered the whole crust, but you can leave an edge of crust showing if you like). 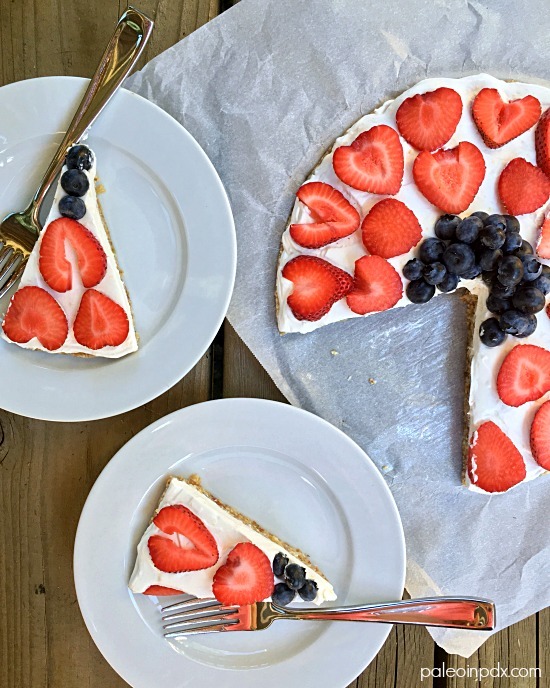 Decorate with fruit of choice and chill in the fridge for 20-30 minutes before slicing. Store any leftovers in the refrigerator and eat within a few days. Think I found my dessert for the 4th of July with fresh Alpena berries! Wonderful! Sounds perfect with the Alpena berries!